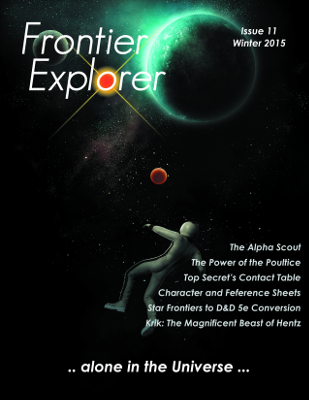 Issue 11 of the Frontier Explorer is now available for download. One of the big events in the past few months has been the release of the D&D 5th Edition rules. The Frontier Explorer is proud to present a conversion for the Star Frontiers races and weapons to the 5th Edition system. Written by Michael Long, he and friends have play-tested this conversion to work out the kinks so it should flow smoothly into your game. For those of you who play D&D and want to try a little Star Frontiers, this is for you.